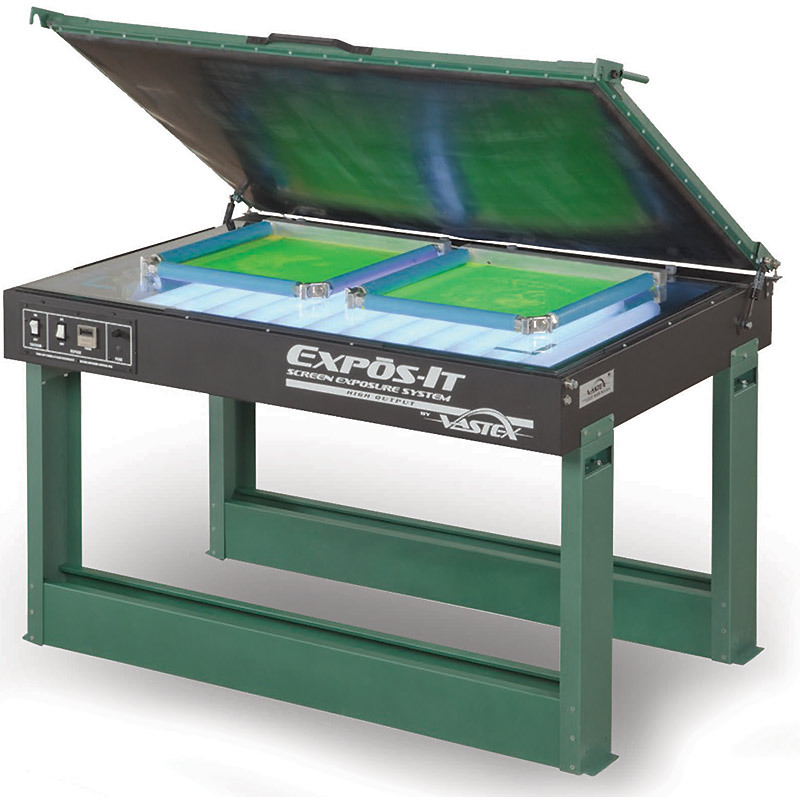 The E-1000 is a table-top exposing unit that conveniently fits in a compact space, making it ideal for the start-up shop. It measures 36 inches by 36 inches by 16 inches with the lid down but will exposure screens up to 21 by 24 inches including Newman Roller’ manual MZX frames. The unit runs on four UV black light bulbs and includes an analog timer that will turn on the exposure lights at the start of the cycle and turn off the lights and vacuum pump when the cycle is complete. The unit uses an industrial rated vacuum pump and a neoprene black rubber blanket to secure frames against the glass for a solid seal. A steel framed vacuum lid is held up by two gas springs and has two ball-bearing latches for added durability. Like all Vastex exposure systems, the E-1000 is fitted to work with the VRS pin registration system ensuring that screens are always in register. Due to its compact size, it can easily be positioned on top of either of Vastex’s screen drying cabinets to save space.